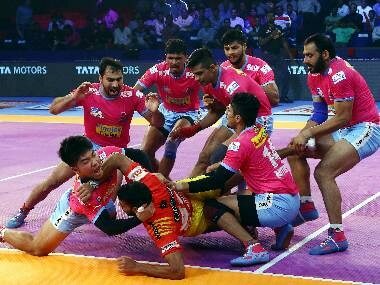 Preview: Kabaddi action makes its next stop in the capital city as Dabang Delhi host Jaipur Pink Panthers in the first game of their home leg in Pro Kabaddi Season 6 at the Thyagaraj Sports Complex. The two teams met earlier in the campaign in Mumbai where Dabang Delhi came out on top by a scoreline of 40-29. Naveen Kumar, Meraj Sheykh and Chandran Ranjit combined to score 27 raid points in a solid outing for their team. Rookie Naveen Kumar has been stellar in his maiden VIVO Pro Kabaddi campaign and has already amassed over a 100 raid points in 13 matches. 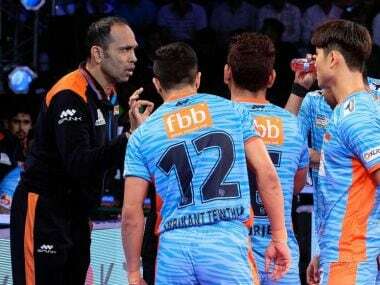 Kumar scored a Super 10 in his last appearance against Jaipur Pink Panthers and Dabang Delhi will be hopeful of a similar performance from their young star to close the gap on third-placed Puneri Paltan. Veteran Mohit Chhillar has been a rock at the Right Corner position for Jaipur Pink Panthers in Season 6 and has an excellent record in assists as well as tackle points with 22 and 29 to his name respectively. Chhillar was limited to a single point in his previous outing against Dabang Delhi and, if Jaipur Pink Panthers are to win this contest, Chhillar’s performance will be extremely important for his side.